She's hoping that strong support in her home state — which happens to be in the upper Midwest, neighboring states where Donald Trump carved his path to victory — can translate into support from primary voters looking for someone who can beat President Trump as they choose the 2020 Democratic presidential nominee. But on the way, Klobuchar faces some obstacles: her moderate politics (at least, relative to many of her competitors for the nomination) may turn off some Democratic primary voters, as may some of the reports that she has mistreated her staff. 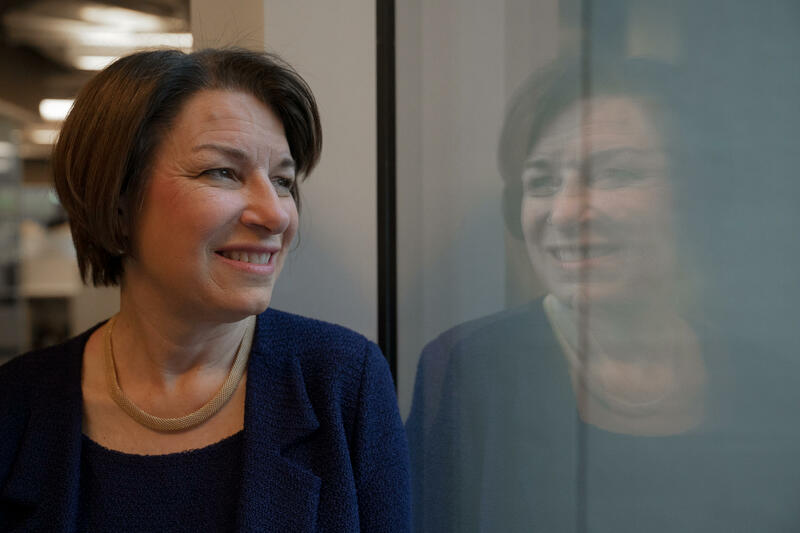 Klobuchar discussed her approach to policy, politics and leadership with NPR's Rachel Martin. She's the fifth 2020 candidate to talk to Morning Edition for an Opening Argument conversation, exploring the presidential candidates' core messages. Martin: Several Democratic presidential candidates support some version of "Medicare for All" or single-payer health care system. Do you? Klobuchar: Every American deserves affordable health care, and we have to move to universal health care. So, what I support is moving to universal health care as quickly as possible. Martin: And when you say universal health care, you mean a single-payer system. Then, the public option, in the first year we should pass legislation for a public option that could be done with Medicaid or with Medicare. You could expand Medicare. You could expand Medicaid, but have a public option, which is the original idea that President Obama conceived. Why? Because then you would have a less expensive option for people to go to. That could result in a lot of people leaving other private plans to go to that public option, and Medicaid's an interesting way to do it. Many Democrats in this presidential field are backing some form of single-payer health care, following the lead of Bernie Sanders' 2016 campaign, in which he pushed his Medicare for All plan. That sets Klobuchar apart from some of her competitors. Her route to "universal health care" doesn't mean putting everyone on a government-administered insurance plan. Rather, she first supports a bipartisan plan backed in the last Congress by Sen. Patty Murray, D-Wash., and Sen. Lamar Alexander, R-Tenn. That bill, which ultimately failed, would have stabilized the Obamacare exchanges. In addition, Klobuchar has said that she wants to allow people to buy into Medicaid via a bill sponsored by Sen. Brian Schatz, D-Hawaii — a "public option" plan. That said, Klobuchar explains that she's not exactly against Medicare for All. She told NPR, "We may end up there one day. But what's the fastest way we can expand health care more immediately?" Martin: More than any candidate, in a very large field of Democratic presidential hopefuls, you have a proven record of working across the aisle with Republicans. You are by most definitions someone who legislates from the center — a political moderate. Do you think that helps you or hurts you in this campaign? Klobuchar: I would hope that it helps me, because when you look at my record I have stood up on so many progressive issues, whether it is choice, whether it is the environment, whether it is standing up for immigrants and against racial injustice. But there are moments where we can find common ground. ... I worked with [Former Utah GOP] Sen. [Orrin] Hatch to get a billion dollars for school safety after the tragedy in Parkland. But that doesn't mean that I don't stand my ground. So while I was the lead Democrat on the school safety money, which passed overwhelmingly, I also was standing my ground against the president when it comes to universal background checks and an assault weapon ban. I sat directly across from him at that meeting, listened to him say nine times he wanted to get universal background checks done, and then saw him bow to the NRA the next day. That's just wrong. So, I use that example because on one hand you can find common ground with people like Sen. Hatch on the billion dollars for school safety, and then you can fight the bigger battles. Progressive voters are clearly energized in this campaign, as evidenced by the kinds of positions many of the candidates are taking. Klobuchar still takes some relatively liberal stands — she's a co-sponsor on the Green New Deal, and a public option isn't exactly a popular proposal among Republicans. But she has also stopped short of endorsing Medicare for All and said she opposes tuition-free college. Her willingness to reach out to Republicans might help her with those voters who believe Washington is broken, and that compromise would break gridlock. But it's easy to see how in a primary, running as a candidate who reaches across the aisle might not endear her to those Democratic voters who simply do not want compromise on their most important issues. And while Democrats say they want someone ultimately who is "electable," there are disagreements over whether that means someone who can appeal to the political center or has a clear, progressive message to excite the party's base. Martin: Sen. Elizabeth Warren — also running for president — has identified privacy and transparency as an issue when it comes to these tech companies... She wants to break up those companies, so that they can't sell the same products on their platform where competitors are also trying to get an edge in. Do you agree with that plan? Do you think it goes too far? Klobuchar: Well, what's interesting is I see it an even larger way, which is why I've been trying to use antitrust law and make changes there. ... Yeah, some of them you may spin off parts of the companies, some of them you may break off. And you can do things like that, but I think you should do it by getting those things investigated and figure out which company is doing what, number one. Number 2: I would then change the standards under the law so that no longer does the government have to prove that it reduces competition to throw something out; that in fact the companies have to prove that they don't materially reduce competition, which is also a language change to the standard, and also that you can look back at deals like what Facebook just did by buying Instagram and other apps, that you can look to see, even though they already did it, is that anti-competitive? Tech regulation and, more broadly, antitrust regulation may be topics on which Klobuchar can set herself apart from a wide field of candidates. She is well-respected for her knowledge on the topic, and it's an area where she has been active in the Senate. Along with Sen. Mark Warner, D-Va., and the late Sen. John McCain, R-Ariz., she introduced the Honest Ads Act in 2017. That bill would require better disclosure of the people and organizations who fund online political advertisements. She has also introduced antitrust legislation that could make mergers tougher for large companies. While that might be a dry policy topic to many voters, it could be more of a hot topic this year, as tech firms' uses of customers' private data, as well as the spread of hate speech and propaganda online, have angered many Americans. Martin: There are reports citing several former staffers from your office who allege that you mistreated them. And I ask about this because we are in a moment in this country where we are having a national conversation about power and workplace dynamics and what is acceptable and what is not, especially in a leader. Do you think your behavior in these instances should raise concerns in the minds of voters? Klobuchar: No, I don't. And I would first point to that over 60 of our staff — former staff came together, everyone from chiefs of staff to people on the front line that worked with me, that were in the car with me all day, and said that they had a good experience working in our office. So, to me that was really important when I saw that letter, and I think it's worth looking at. So that's the first thing. Secondly, I do have high standards. I do push people hard. I have high standards of myself, of our staff and also for our nation. And so that is the way I'm going to look at this going forward. And that is — I can always do better and I will. But we have gotten so much done with our team. My state director has been with me seven years. My chief of staff around five years. My campaign manager 14 years. You don't win elections like we have, which is winning every single congressional district in Minnesota, including [former GOP Rep.] Michele Bachmann's. You do not pass — get Vanderbilt to rate you as the No. 1 Democratic senator for getting things done under 15 metrics in the U.S. Senate and the first minority party senator to break the top five since John McCain in 1994. You don't get that done alone. You get that done because you have great staff that work with you, and they're not only just working for me, they are working for our country, and I'm very proud of them. In multiple news stories, former Klobuchar staffers have alleged that the senator engaged in abusive behaviors from bullying to throwing a binder that accidentally hit a staffer. That is raising questions for voters, and Klobuchar has been attempting to answer those stories by acknowledging her high standards for her staff. She has also taken the chance to pitch herself as a candidate with a strength of character that would serve the country well. "When you're out there on the world stage and dealing with people like Vladimir Putin, yeah, you want someone who's tough," she told CNN. "You want someone that demands the answers and that's going to get things done, and that's what I've done my whole life." Senator Amy Klobuchar wants it both ways. She's built her career as a moderate who can strike compromise with the other side. But as a Democratic candidate for president, Klobuchar calls herself a progressive. So what do her policies look like? The Minnesota senator said she would push for free four-year college if she was, quote, "a magic genie," and she called the Green New Deal aspirational. I sat down with her last week - it's part of our Opening Arguments series with 2020 candidates - and I asked her about those proposals. AMY KLOBUCHAR: I'm actually a co-sponsor of the Green New Deal, and that's because I think it is so important to stop just talking about and admiring the problem, that we have to actually get these things done in a big, bold way. KLOBUCHAR: Well, that is for a reason because I think most people agree, including some of the primary sponsors, that we won't be able to get all this done in 10 years. But if we don't start, and we don't capture the energy of young people that want to move on this issue, we're going to go nowhere. On the issue of college, I am all in on free one and two-year colleges, degrees for things that we need right now in terms of our economy. KLOBUCHAR: Do I think every kid in America should get free college? No because I look at them in the future, in that we want to watch the debt because it's going to be on all their shoulders. And also, we have priorities for what we want to do with education, and that's certainly not happening with Betsy DeVos. All of that said, one of my main goals in the Senate, where there is so much polarization and people standing in opposite corners, has been to be a force of good, to work to get things done. There are some things where I take a stand and I'm on a bill just with Democrats. But then if I can find some middle ground and actually get something done, like, on human trafficking, I'm going to go for it. And I think that's what not just people of America want. I think that's what Democrats want. And I don't think it will hurt me in a primary. I think it will help me. MARTIN: I do want to focus in on climate change. What are the solutions that you would push in your first term as president? KLOBUCHAR: People have now learned that this is happening. Even a decade ago, five years ago, I think it seemed more esoteric as a bunch of numbers that we put out there. So the first thing that I would do is to get our country back in that Paris climate change agreement. No. 2, there was some good work done by the Obama administration on clean power rules. And it's literally just on the cutting room floor. You wouldn't have to go through Congress to get those done. MARTIN: Would you declare a national emergency over climate change? KLOBUCHAR: Now, that national emergency term was overused - that's putting it lightly - by the president. And to me, that means an immediate national disaster of some kind. I see climate change as the major challenge of our time. And you can say that without calling it a national emergency. Now, coming out of it are national emergencies. All of these strange weather patterns, and these sudden increase and warming of our seas and increase to the sea levels, that causes a lot of these, what end up being national emergencies. MARTIN: The other major issue for Democratic primary voters is health care. Several Democratic presidential candidates support some version of "Medicare for All" or single-payer health care system. Do you? MARTIN: When you say universal health care, you mean a single-payer system? KLOBUCHAR: I mean health care for everyone. And I think I am open to looking at that, let me make clear, the single payer. And we may end up there one day. But what's the fastest way we can expand health care more? Immediately, I would do cost-sharing and reinsurance. So that's a bill that's out there right now to help with premiums. That's just an immediate, like, put a Band-Aid on answer. Then we should pass legislation for a public option. You could expand Medicare. You could expand Medicaid. But have a public option, which is the original idea that President Obama conceived. Why? Because then you would have a less-expensive option for people to go to. MARTIN: Are you a revolutionary? KLOBUCHAR: (Laughter) I am a progressive that wants to see change. MARTIN: You have spent a lot of time in the Senate pushing legislation to hold technology companies to account for how they use people's data. KLOBUCHAR: I am kind of a revolutionary when it comes to tech companies. KLOBUCHAR: Well, for a long time, everyone was just believing what the tech companies wanted. I, for a long time, have been suspicious of this because I've seen how much they're growing. I've seen how much money they're making off of it. And I, maybe, was naive like everyone else. I didn't really understand. They were making money, not 'cause of just advertising on their sites. They were making money off of us. They were taking our personal information, and they were selling it to other people, or they were targeting us in such a way that we became even more valuable to them. So I came up with these policy ideas. First, consumer. And that means things like privacy legislation. And I have bipartisan legislation, one of the only big bipartisan bills, that I wrote with Senator Kennedy. Secondly, to have antitrust laws enforced in a better way. And then the final thing is national security. We have put ourselves in a place where we have a foreign country that's trying to influence our election. MARTIN: Senator Elizabeth Warren - also running for president - she sees the problem in an even larger way. She wants to break up those companies so that they can't sell the same products on their platform where competitors are also trying to get an edge in. Do you agree with that plan? KLOBUCHAR: Well, what's interesting is, I see it an even larger way, which is why I've been trying to use antitrust law and make changes there. So it's not just tech companies. It's also pharma companies. And that is changing the standard in our antitrust law. That is legislation that I proposed before most people were even talking about this. MARTIN: You are putting your name forward to be the most powerful leader in the world. There are reports citing several former staffers from your office who allege that you mistreated them. And I ask about this because we are in a moment in this country where we are having a national conversation about power and what is acceptable and what is not, especially in a leader. Do you think your behavior in these instances should raise concerns in the minds of voters? KLOBUCHAR: No. I don't. And I would first point to that over 60 of our staff, former staff, came together - from everyone from chiefs of staff, to people on the frontline that worked with me, that were in the car with me all day - and said that they had a good experience working in our office. Secondly, I do have high standards. I do push people hard. I have high standards of myself, of our staff and also for our nation. And so that is the way I'm going to look at this going forward. And that is, I can always do better, and I will. But my state director's been with me seven years. My chief of staff, around five years. My campaign manager, 14 years. You don't win elections like we have. You do not pass - get Vanderbilt to rate you as the No. 1 Democratic senator for getting things done under 15 metrics in the U.S. Senate and the first minority party senator to break the top five since John McCain in 1994 - you don't get that done alone. You get that done because you have great staff that work with you. And they're not only just working for me, they are working for our country. And I'm very proud of them. MARTIN: Democratic Senator and presidential candidate Amy Klobuchar of Minnesota. Senator, thank you so much for your time. KLOBUCHAR: Well, thank you. It was wonderful to be on, Rachel. Transcript provided by NPR, Copyright NPR.